The biggest industry-wide adjustment to advisor compensation models is upon us. Boston, April 25 2017 – The compensation landscape for financial advisors has slowly evolved over the years toward an open-architecture and recurring fee-based environment. Most firms operating in the U.S. have been reviewing and adjusting their compensation structure due to the pending U.S. Department of Labor (DOL) fiduciary rule, which will require adjustments to most commission-based compensation for retirement accounts in the U.S. 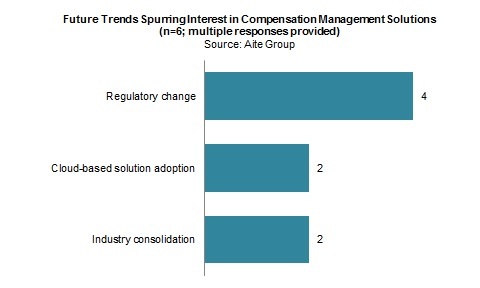 Beyond regulation, what other trends are spurring interest in compensation management solutions? This Impact Note first identifies and elaborates on key market trends driving interest in compensation management solutions by U.S. wealth management firms. The report also examines buyer behavior and firms’ experience with their compensation management solution. It is based on data sourced from interviews conducted in Q3 and Q4 2016 with 19 wealth management firm executives familiar with their firm’s compensation management technology and operations. This 25-page Impact Note contains 16 figures and two tables. Clients of Aite Group’s Wealth Management service can download this report, the corresponding charts, and the Executive Impact Deck. This report mentions Broadridge Financial Solutions, Castine Consulting, EAI Information Systems, Financial Database Services, jaccomo, and Xtiva Financial Systems. DOL Fiduciary Rule: Has the Train Left the Station?